Tempe, Arizona: Crane Designs, 2018. Edition of 5. 7.25 x 5.25 closed, extends to 7.25 x 50"; 10 panels (20 pages). Double-sided accordion. Materials: glass beads, fabric, metal rings, red waxed polyester thread, white linen, found and commercial fabric (cotton, linen, silk, polyester), leather, carved bone and pewter charms. Processes: sewing, digital printing, handwriting, embroidery, applique. Slipped in matching textile envelope case. Numbered. Marian Crane: "It is my hope that these five paperback sized books mark a moment in American history when the forces of sanity marshaled themselves and drove down their domestic and foreign attackers. Failing that, I hope these books mark a moment of deep and sincere protest to inspire future readers to safeguard their democracy. "On a striped white linen background, over sixty layered sewn collages ... weave a text about the National Rifle Association's disturbing links with white supremacists, hostile foreign governments, and Christian theocratic groups within and without the United States of America. 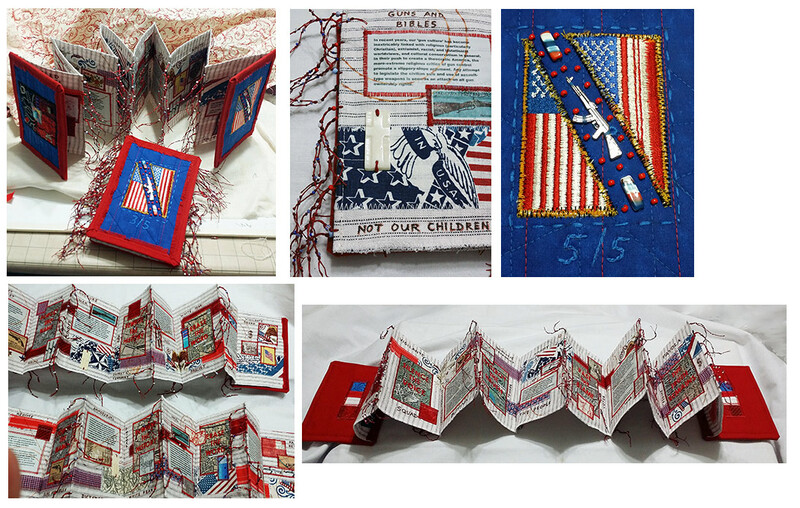 "The central text is embroidered in red thread atop heavily altered fabric-printed maps of school shooting locations, NRA headquarters, Washington DC, and Mar-a-Lago. It revisits a text I used in 2002 for 'The Truth Remains', about anti-gay vandalism at the San Francisco Public Library. By the summer of 2016 I was fairly certain Donald J. Trump would secure the Republican nomination, and the GOP would use every resource (legal or not) to help him win. I began planning and collecting material for the second version of 'The Truth Remains' the day after that nomination. My research eerily paralleled the Mueller Investigation into Trump's and the GOP's alliance with Russian hackers and politicians bent on sowing chaos in the US and discrediting democracy worldwide. "Smaller text appliques discuss the Second Amendment's original wording and its perversion among some American subcultures, the phenomenon of school and other mass shooting events, and the incident in December 2017 when my own high school suffered two casualties from a former student intending on mass death. "Hand-inked text lists topics linked to gun-rights, gun-control, theocracy movements, and the GOP's obvious use of gerrymandered districts, voter suppression, illegal campaign funding, and foreign hacking to remain in power in a society rapidly outgrowing its conservative tenets." Tempe, Arizona: Crane Designs, 2016. One-of-a-Kind. 1.25 x 3 x 2.75"; 22 cloth pages. Miniature. Each leaf with recto of turquoise cotton embroidered with text and embellished with scrimshaw mother-of-pearl discs; verso of appliqued gold/green fabric, hand-marbled cotton, and commercial cotton print. 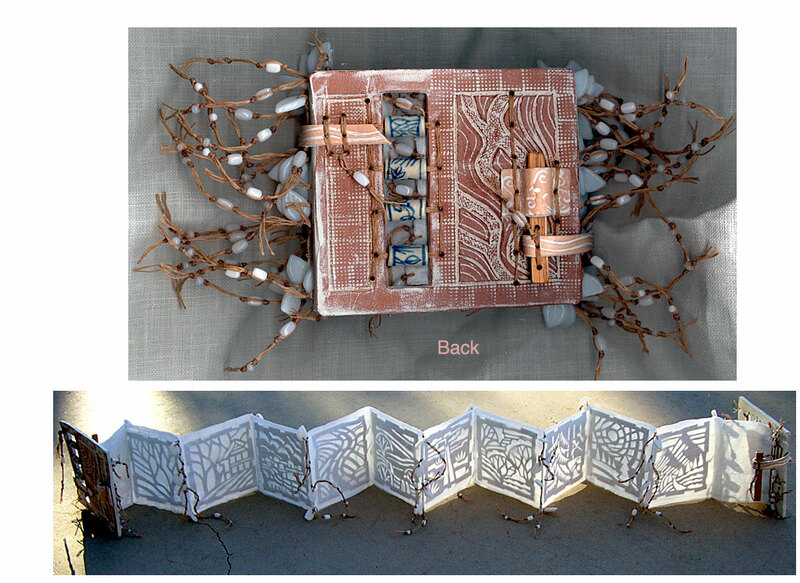 Bound in covers of re-purposed shell pendants incorporating white mother-of-pearl and abalone shell. 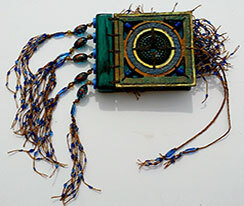 Single-needle Coptic binding with waxed brown polyester cord plus braided endbands and decorative terminals finished with shell and opal glass beads. Closure of braided ties. 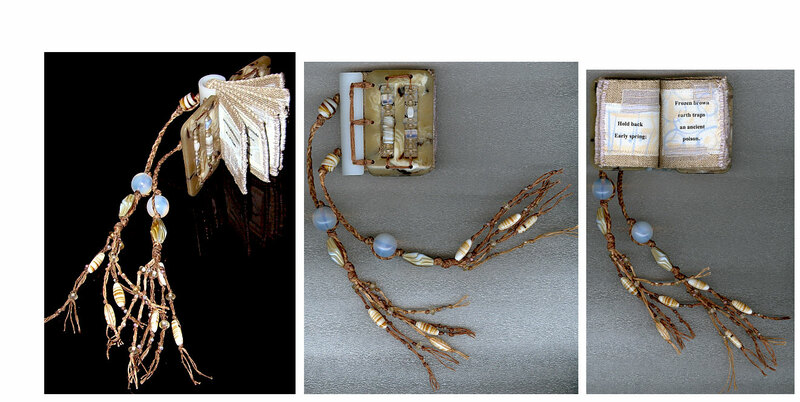 Longer braided cords knotted with abalone shell and opal glass transforms book into necklace. Marian Crane: "'Twilight Arc' aka twilight arch or earthshadow is simply the earth's shadow cast into the atmosphere, above the horizon opposite the sunset or sunrise. "'Flyte' from our friends at Wikipedia: 'Flyting is a ritual, poetic exchange of insults practiced mainly between the 5th and 16th centuries. The root is the Old English word fl?tan meaning quarrel (from Old Norse word flyta meaning provocation).'" Tempe, Arizona: Crane Designs, 2015. One-of-a-Kind. 9.5 x 4.25 x 2" closed. Construction: combination accordion-fold with five pages, and one fold-out stylized cityscape. Semi-soft fabric covers anchored by leather and fabric loops with handmade beaded buttons. Machine and hand-stitched fabric applique using commercial cotton batik, silk, linen, opalized leather, and polyester fabrics. Hidden stiffening support structures of stainless steel wire, plastic canvas, and heavy polyester interfacing. Accented with glass beads and polyester cord tassels. Materials include cotton, linen, silk, polyester, plastic canvas, Beacon Fabri-Tac glue, glass beads, buttons, acrylic paint. Signed and dated by the artist. Crane's inspiration for Night Flight was the night-time views of cities where she has lived and traveled, places like Denver and Phoenix. Tempe, Arizona: Crane Designs, 2011. One-of-a-Kind. 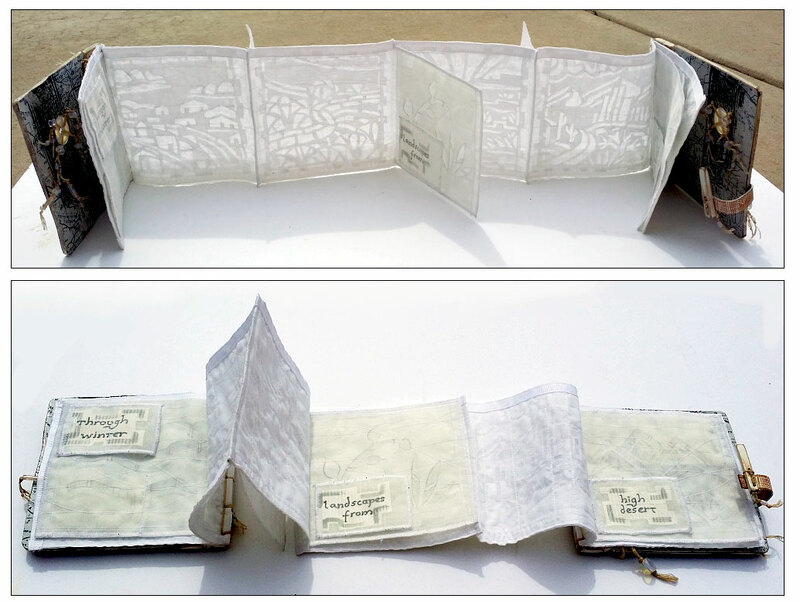 5.5" x 6" x 1.25" double-sided accordion-fold book. Materials: white nylon organdy, recycled silkscreen fabric, and recycled rip-stop nylon. Hand-cut nylon panels shadow-appliquéd into sheer nylon pages, which are overlaid with machine stitching and edged polyester thread. 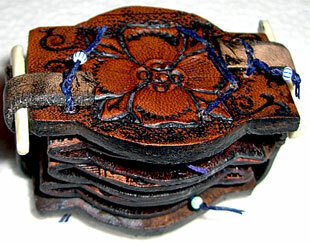 Covers of carved and painted leather, white-washed oak, opaline glass, and waxed polyester thread. Inner covers lined with scans of an 1881 Arizona map, and black monoprint designs. Oak pin and loop closure at each vertical side. Signed and dated by the artist. 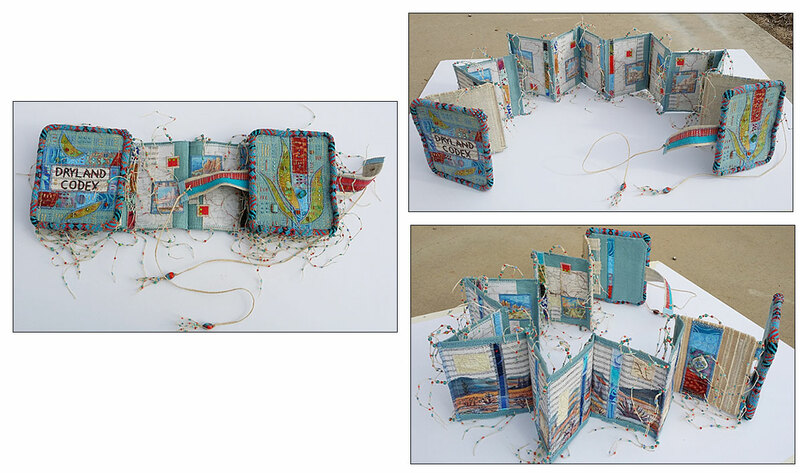 This is a larger version of the first Road Trip book created in 2010. Six shadow applique cut-outs follow a Southwestern road trip from a house in a tree-filled suburb, through industrial areas, desert plains, and into mountains. Scottsdale, Arizona: Crane Designs, 2008. One-of-a-Kind. 5 x 4"; 12 pages. Materials: linen, cotton, leather, glass, polyester, acrylic, paint, bronze foil. 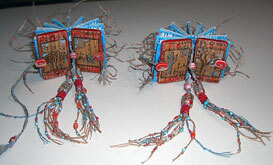 Cloth pages accented with bead and thread tassels. 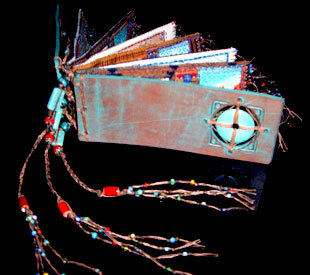 Painted leather covers with wooden spine accented with beads and tassels. Marian Crane: "A meditation that began with the sight of Rose Windows in cathedrals, and expanded to contrast our reactions to natural and manmade beauty." Tempe, Arizona: Crane Designs, 2014. One-of-a-kind. 5" x 4" x 1.75"; 24 pages. Embroidered and appliqued linen and cotton pages. Illustrative processes and materials include commercial and digitally-printed cotton, cotton machine-made lace, hand embroidered spider webs, and glass beads. Bound into a repurposed commercial masonite/poplar photo book with pages anchored into rotating wood spine. Covers layered with acrylic paint and ink, and finished with satin varnish. Signed and dated by the artist. Marian Crane: "The text is an original poem by the artist with the theme of the dangers of relying on/challenging gods." Tempe, Arizona: Crane Designs, 2010. Edition of 2. 2 x 2.5 x 2"; 32 pages. Coptic-bound. Woodburned and painted oak covers. Finished with polyester tassels and glass beads. Marian Crane: "Stylized desert landscapes in appliqué cotton batik alternate with inked cotton street maps of the industrial and residential areas in and around Chandler, Arizona." 4.5 x 5.5 x 3" closed, extends to 51.5"; 12 panels. Double-sided accordion structure. 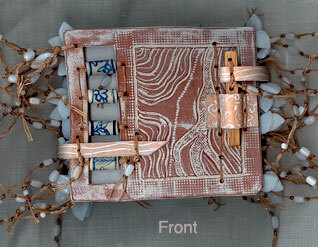 Materials: cotton batik, ink jet print on cotton, linen, silk, acrylic paint, porcelain, glass beads, waxed polyester. Bound in covers of same materials with reinforced edges and embellishments. Strap and tie closure. 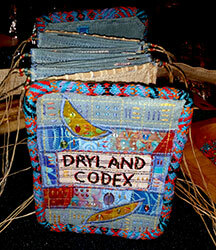 Marian Crane: "Dryland Codex is an accordion book with original landscape paintings on one side, and map/fabric collages on the other. This is another in my Southwestern Wanderlust loose series. This one combines scanned maps from 1930s Arizona and New Mexico with digitally printed versions of my original acrylic landscape paintings of the same areas. 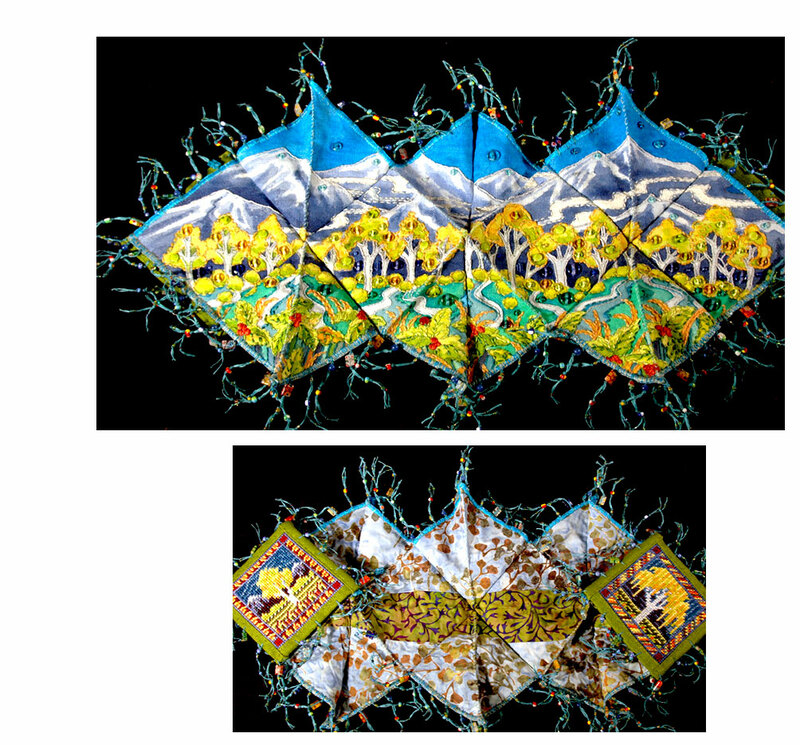 A sprawling high-desert landscape in autumn colors is painted on the reverse, and both sides are accented by glass beads and constructed-fabric applique strips." Tempe, Arizona: Crane Designs, 2010. One-of-a-Kind. 2.25 x 1.5 x 1"; 6 leaves. 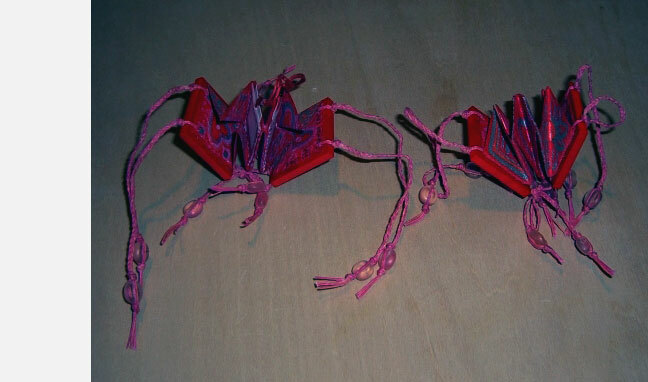 Miniature accordion fold. Net appliqué pages embroidered with glass flower beads. Painted leather covers secured by bone closure pins. 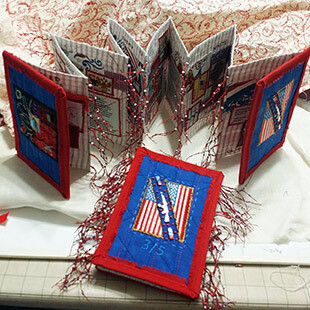 Each side of this new miniature from Marian Crane is a tiny world of fiber art. 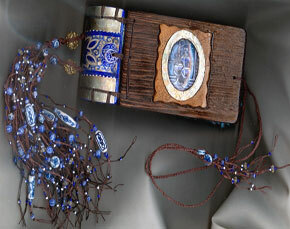 On one side are the glass flowers – embroidered pages with beads forming flowers. On the reverse framed by painted leather are the backs of those net appliqué pages. These as well have a delicate beauty. Holding the pages so that the light falls through shows delicate blue patterns. Tempe, Arizona: Crane Designs, 2011. Edition of 3. 4.25 x 4.25"; 8 pages. Modified accordion structure. Fabric painted linen. Cotton batik appliqué. 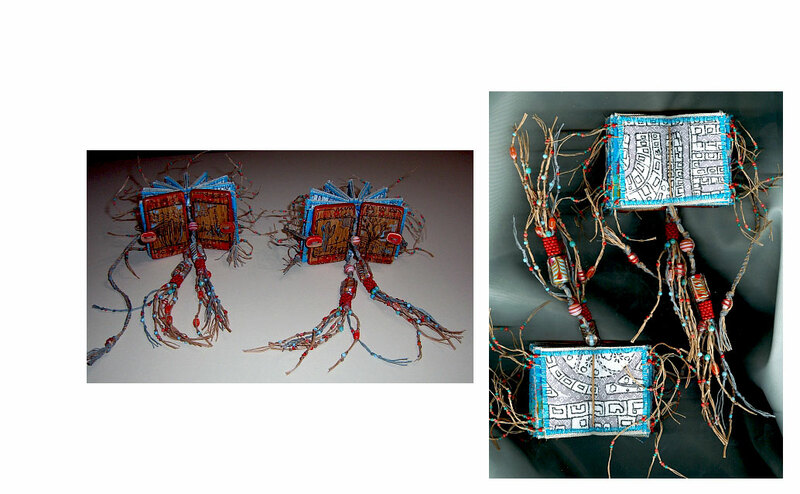 Softcovers of batik accented with cotton embroidery thread and glass beads. 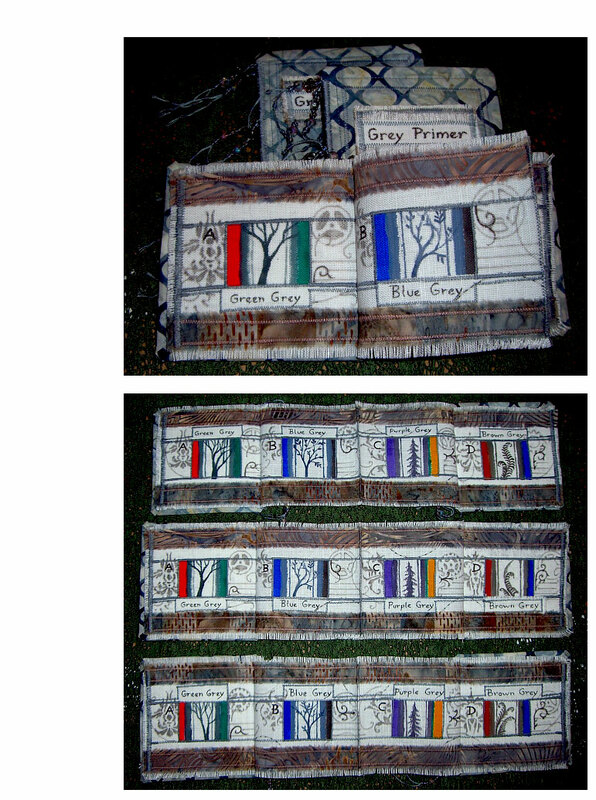 Marian Crane: "Each book showcases four different greys (green-grey, brown-grey, blue-grey, and purple-grey) mixed from complementary colors along with botanical vignettes painted in each grey." Tempe, Arizona: Crane Designs, 2007. One-of-a-Kind. 2.25 x 2.25 x 1"; 12 pages. Miniature. 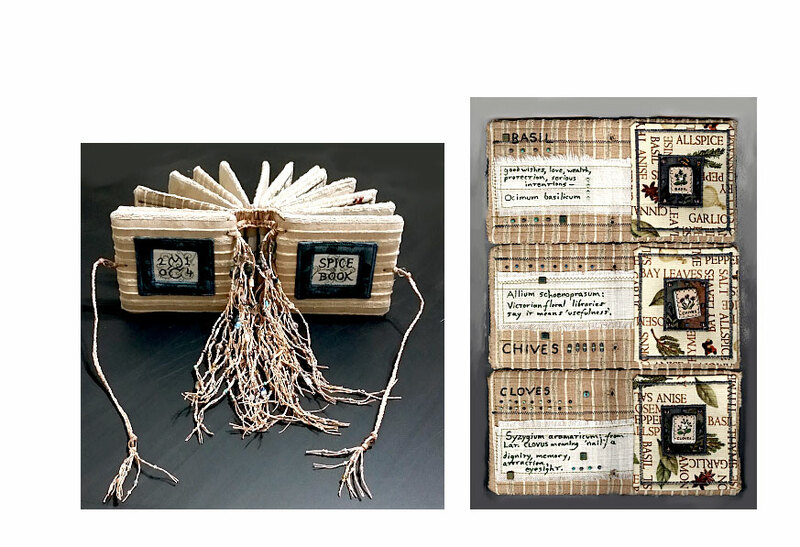 Pages of linen, cotton, ramie, and polyester thread. Bound in white and marble lucite acrylic with cotton and bead tassels. 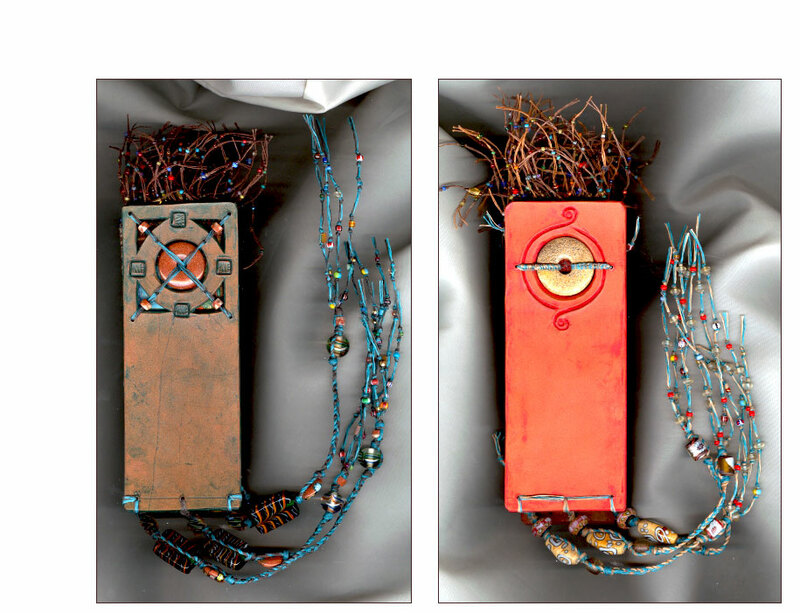 Marian Crane: "All too often, modern craft artists champion the use of found and reclaimed materials, on the merits that they are preventing such material from going to waste. However, that material was already extracted and processed using finite energy and resources. I have no idea if craft artists are part of the solution or the problem, but we should not be blind to the ultimate price of our craft." 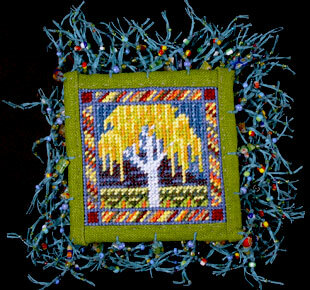 A scroll 2.25" high (beadwork makes it 4.5); extends to 21". Linen, acrylic paint, cotton thread, glass, polyester, osage orange wood spindle with rubbed beeswax finish. 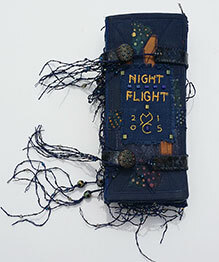 This painted and embroidered scroll was inspired by a few lines from the early 19th-century poet, Thomas Lovell Beddoes: "Tell me how many bead there are in a silver chain / of evening rain / unraveled from the tumbling main / and threading the eye of a yellow star / so many times do I love again." 4 x 5 x 2" closed, 4 x 44" open; 12 pages. Double-sided accordion structure. Hand-cut nylon panels shadow-appliquéd into sheer nylon pages, which are overlaid with machine stitching and edged with glass beads and polyester thread. 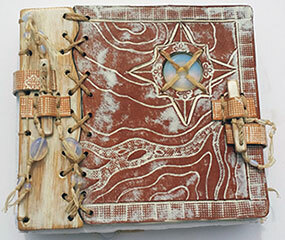 Cover is carved and painted leather, porcelain beads, polyester thread, and oak pins. Images depict a house amid trees, a road winding from an urban setting through rural desert and up into pine-covered mountains. Marian Crane: "It's inspired by Japanese stencils, a frequent road trip of my youth along southern Colorado roads, and some other pierced-page artists' books I've seen." Scottsdale, Arizona: Crane Designs, 2008. Edition of 2. 1.5 x 1.5" miniature. Star structure. Hand painted wooden boards with waxed thread closure. 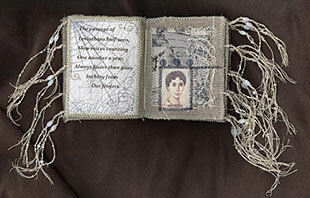 Marian Crane: "Two tiny books fold out to reveal hidden pockets [where one could insert] messages or photos. 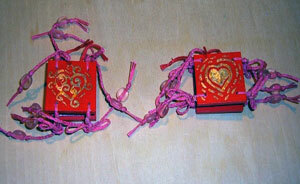 Valentine hearts in acrylic paint accent the felt pages and wood covers." 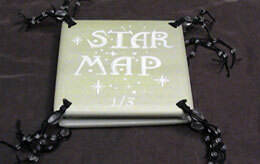 5 x 5 x 1.25" (closed) map fold book. Painted, embroidered, and beaded linen. Backed with pieced cotton batik. Needlepoint and fabric appliqué covers. Adornments of beaded poly cord fringe. Marian Crane: "Depicts a lush mountain valley in the fall, with golden trees against a backdrop of blue and white peaks." With the map fold structure, Shangri La bursts forth with surprising beauty, and disappears with surprising ease. Tempe, Arizona: Crane Designs, 2014. One-of-a- kind. 3.5" x 4" x 3.5"; 24 pages. 12 pages/24 views worked in commercial cotton fabric applique, beading, embroidery, and hand-inked text and sketches. 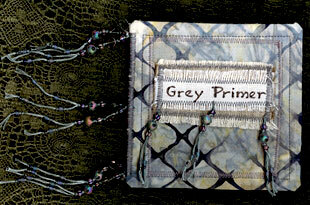 Bound in fabric covers of tan and dark blue/grey/green, framing title, and signature. 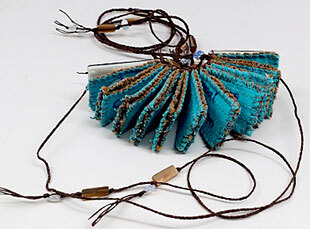 Bound using a double needle Coptic with tan waxed polyester thread, accented with long tassels of twine and pale green, pale blue, iridescent gray, and striped metallic glass beads. Marian Crane: "Theme worked around six Trena Hegdahl 'Herb & Spice' porcelain buttons circa 1996: Basil, Chives, Cloves, Mustard, Sage, and Thyme. Each page group showcases an original sketch of the plant, its Latin name, the corresponding button, and attributes from ancient cultures and Victorian floral dictionaries." Tempe, Arizona: Crane Designs, 2004. Edition of 3. 3.2 x 3.2 x 1" using lindenwood, cream linen cloth, black and pale green linen thread, glass beads, luminescent paint and thread. The boards are shielded behind three coats of Delta Ceramcoat and a UV-protectant film. The black text has swirls of glow paint and glow thread. The glow-in-the-dark thread is rated as washer and dryer safe, and sold primarily for decoration on kid's clothes. Because these are handmade each one in the edition is slightly different. 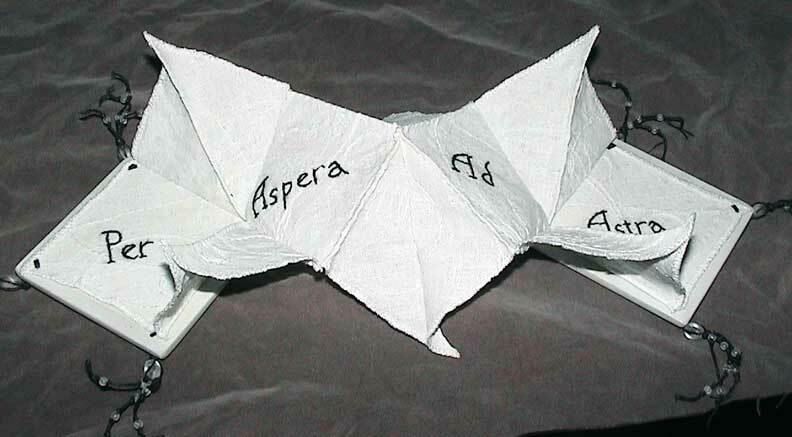 The Latin phrase "Per Aspera Ad Astra" is usually translated as "by rough road, to the stars" - through hardship, toward success and renown. Marian Crane decided it could be a message of hope and endurance to mark the start of a new year. Under normal light, the linen pages appear in different shades of pale green, cream, and black. When moved from strong light into darkness it becomes "a swirling map of stars, magnetic currents, geometric designs, and plantforms." In this light the book becomes a fantasy view of unknown space. Tempe, Arizona: Crane Designs, 2004. One-of-a-Kind. 4 x 3.5" closed, 4 x 17" extended. 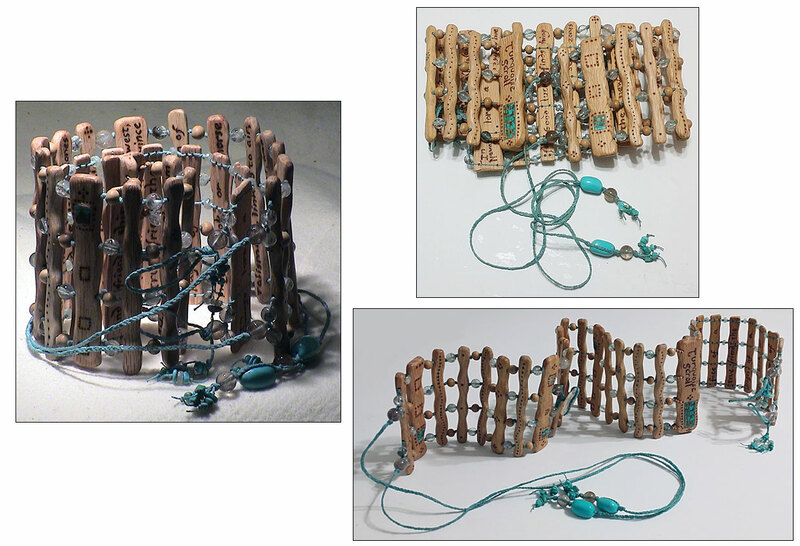 Materials: red Oak; turquoise; sandalwood; rock crystal beads; blue-green linen; agate. Artist signature wood burned. 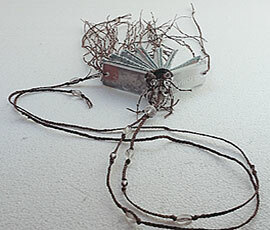 Marian Crane: "A book/scroll when opened 4" x 17" and when wrapped and closed 4" x 3.5". 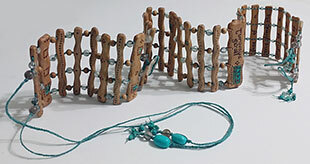 Shaped and drilled red oak twigs inlaid with turquoise, joined with sandalwood and rock-crystal beads strung on blue-green linen. Closure is of agate and turquoise. "The chemical properties, geographic locations, and multi-cultural legends associated with this semiprecious gem wind across both sides of the oak sticks, in wood burned text and abstract designs. The wood is smoothed but unvarnished, allowing the natural fragrances of oak and sandalwood to add a dimension of scent." Scottsdale, Arizona: Crane Designs, 2004. One-of-a-Kind. 3" high, 5.5" wide, 2" deep; 8 pages. 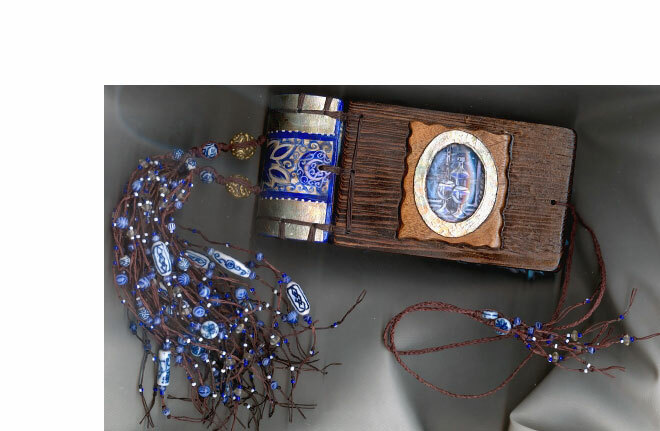 Wenge wood, walnut, leather, dyed linen fabric, printed cotton fabric, cotton embroidery thread, brown linen thread, glass and porcelain beads, rock crystal, acrylic paint. Wooden covers inlaid with rock crystal gems over hand-painted vignettes illustrating the text. 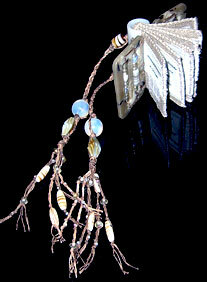 Anchored by two tassels of brown, blue, and white handblown glass beads and Chinese porcelain beads. Primary colors: dark brown, blue, white. 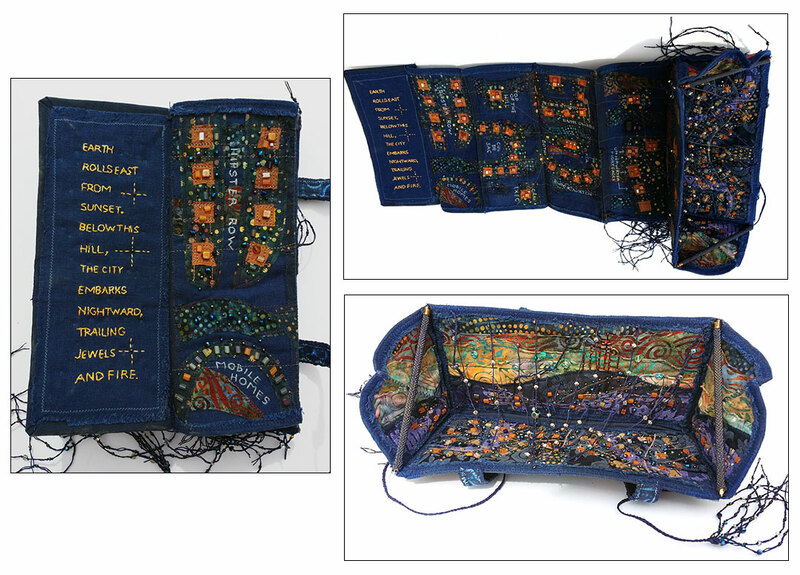 Marian Crane: "Four embroidered and appliqué pages hold an 8-line poem about companionship and aging." Tempe, Arizona: Crane Designs, 2009. Edition of 3 Variants. 6.25 x 2.25 x 2"; 12 fabric pages. Leather covers, glass and stone accents. Fabric appliqué with hand-drawn topographic maps, fabric accents, and fragments of commercial map-printed cotton. The Western Windows series by Marian Crane consists of three sensual journals, each with the same basic format but each unique. They record imaginary travel by someone steeped in the colors and textures of a large swathe of the US Southwest. Marian Crane: "[This series] chronicles imaginary road trips based on U.S. atlases and Route 66 travel postcards." 1″ x 1.75″ x 1.25″; 24 pages. 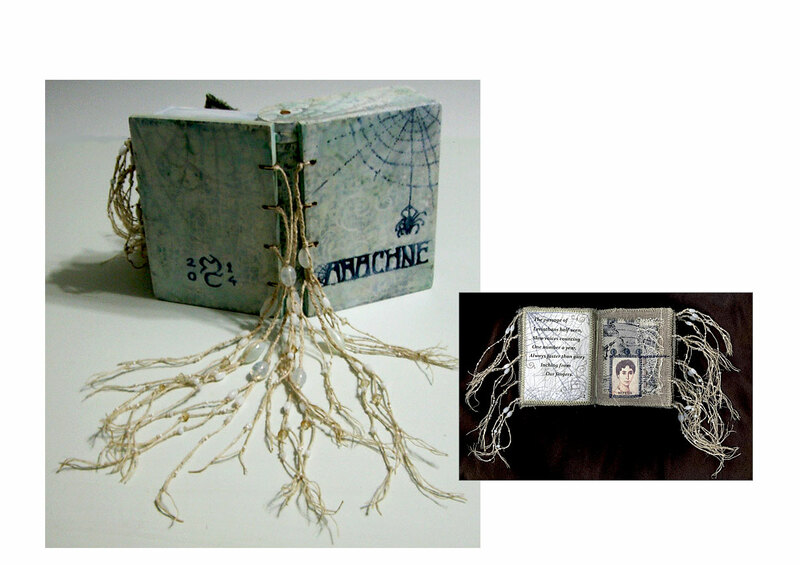 Twelve double pages with hand-inked text and applique rectangles on reverse. 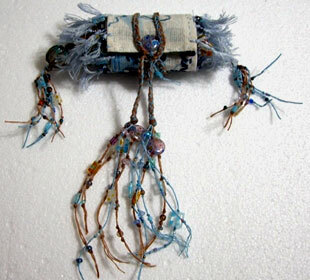 Materials: glass rectangle blanks, glass beads, commercially-printed cotton, sheer nylon repurposed from tea bags, rust linen, green polyester grosgrain ribbon, waxed polyester cord, polyester sewing thread, acrylic ink. Carved and etched glass covers. 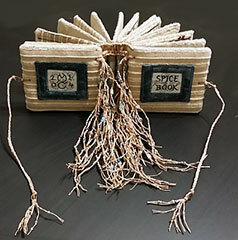 Coptic bound with brown polyester cord and clear/frosted glass bead accents, finished with fore-edge tassels, ties, and necklace cord. Signed by the artist. Inked text by Marian Crane: "Leave the loud world for a moment, learn to think again." 2 x 3 x 2"; 32 pages. 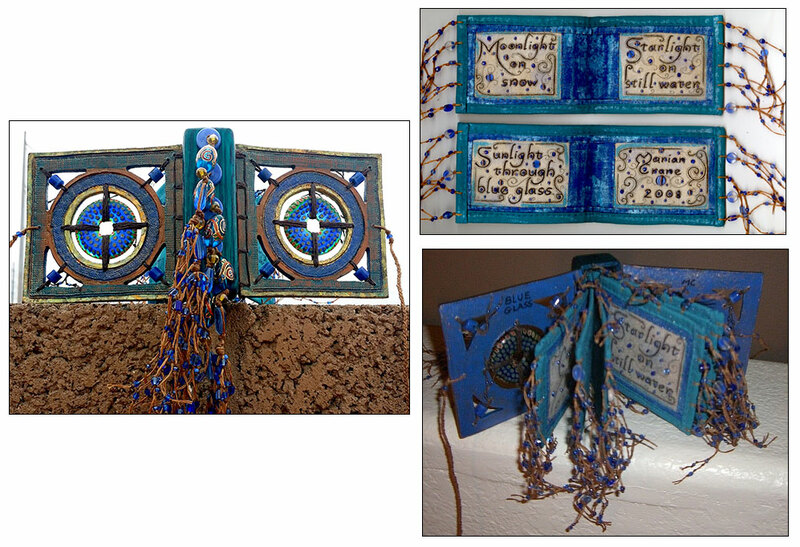 16 coptic-bound pages of appliquéd linen and hand-marbled cotton with orange linen thread. 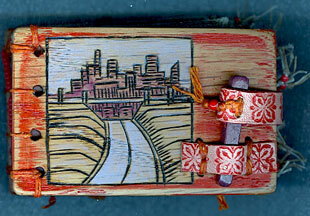 Woodburned and painted oak covers featuring a cityscape. 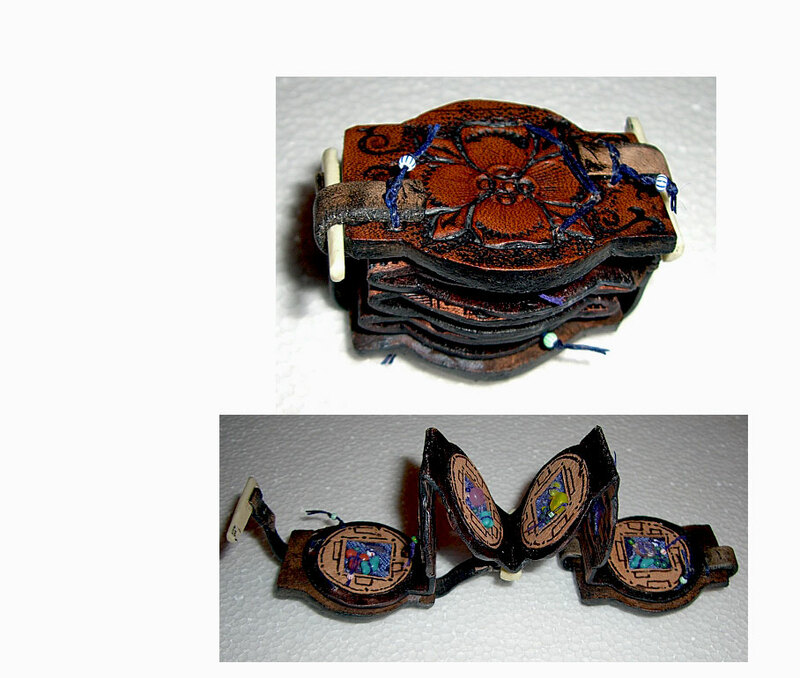 Painted leather and purple-heart wood clasp. Foredges tasseled with polyester threads and glass beads. Marian Crane: "Inspired by an early-morning March road trip into Denver, Colorado, the pages contain an abstract impression of the busy city's streets, signs, and skylines."